OKYO (Kyodo) -- Japanese baseball's Rules Committee agreed Friday to use the same rule regarding tag plays at home plate. The body, which is made up of representatives of amateur and professional baseball, agreed that both sides would enforce a new rule that will prohibit runners from slamming into catchers to dislodge balls, while enforcing for the first time the standard rule that prohibited catchers from obstructing home plate without the ball. Major League Baseball began clarifying the existing rule (7.08＊) in 2014 in order to reduce collisions at home plate. The existing rule prohibited any fielder from obstructing the base path when not in possession of the ball, but Nippon Professional Baseball had long followed MLB's lead by ignoring the rule at home plate. Nippon Professional Baseball will now figure out how to manage the new interpretation. 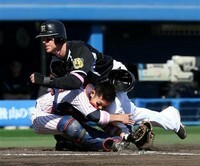 Japanese amateur baseball had already been enforcing this "new rule." Rule 7.08(a) Comment: Any runner after reaching first base who leaves the baseline heading for his dugout or his position believing that there is no further play, may be declared out if the umpire judges the act of the runner to be considered abandoning his efforts to run the bases. Even though an out is called, the ball remains in play in regard to any other runner. This rule also covers the following and similar plays: Less than two out, score tied last of ninth inning, runner on first, batter hits a ball out of park for winning run, the runner on first passes second and thinking the home run automatically wins the game, cuts across diamond toward his bench as batter-runner circles bases. In this case, the base runner would be called out for abandoning his effort to touch the next base and batter-runner permitted to continue around bases to make his home run valid. If there are two out, home run would not count (see Rule 7.12). This is not an appeal play. Rule 7.08(b) Comment: A runner who is adjudged to have hindered a fielder who is attempting to make a play on a batted ball is out whether it was intentional or not. If, however, the runner has contact with a legally occupied base when he hinders the fielder, he shall not be called out unless, in the umpires judgment, such hindrance, whether it occurs on fair or foul territory, is intentional. If the umpire declares the hindrance intentional, the following penalty shall apply: With less than two out, the umpire shall declare both the runner and batter out. With two out, the umpire shall declare the batter out. If, in a run-down between third base and home plate, the succeeding runner has advanced and is standing on third base when the runner in a run-down is called out for offensive interference, the umpire shall send the runner standing on third base back to second base. This same principle applies if there is a run-down between second and third base and succeeding runner has reached second (the reasoning is that no runner shall advance on an interference play and a runner is considered to occupy a base until he legally has reached the next succeeding base). APPROVED RULING: (2) If a base is dislodged from its position during a play, any following runner on the same play shall be considered as touching or occupying the base if, in the umpires judgment, he touches or occupies the point marked by the dislodged bag. Rule 7.08(d) Comment: Runners need not tag up on a foul tip. They may steal on a foul tip. If a so-called tip is not caught, it becomes an ordinary foul. Runners then return to their bases. Rule 7.08(f) Comment: If two runners are touched by the same fair ball, only the first one is out because the ball is instantly dead. If runner is touched by an Infield Fly when he is not touching his base, both runner and batter are out. Rule 7.08(i) Comment: If a runner touches an unoccupied base and then thinks the ball was caught or is decoyed into returning to the base he last touched, he may be put out running back to that base, but if he reaches the previously occupied base safely he cannot be put out while in contact with that base. Rule 7.08(j) Comment: Runner who touches first base in overrunning and is declared safe by the umpire has, within the intent of Rule 4.09(a) reached first base and any run which scores on such a play counts, even though the runner subsequently becomes the third out for failure to return at once, as covered in Rule 7.08(j). (k) In running or sliding for home base, he fails to touch home base and makes no attempt to return to the base, when a fielder holds the ball in his hand, while touching home base, and appeals to the umpire for the decision.